This tried and tested power pedestal has stood the test of time. The C2 series modular design continues to provide the essential services offered by the modern caravan park. Importantly it remains flexible and easy to retrofit new services that may be required well into the future. The C2 series comprise pole mount, pedestal and hybrid pole/pedestal versions. The economical C2-1000 pole mount version is Australia’s most popular service pillar and boasts an extensive proven track record. It fits straight onto your existing or our powder coated aluminium poles (60mm OD) and is easily secured with four bolts. New powerhead-only assemblies can be ordered to upgrade non- compliant boxes. The C2 500PC pole/pedestal version model has been designed to give an option in-between the pole mounted power head and a full long bodied pedestal model. If water is not required and metering is an important requirement, this half bodied model provides the room to include your choice of meters. Economical and easy to read approved panel mounted meters can be fitted. Or you can opt for the newly approved single pole din- rail meters. You also have room to add controllers for a remote meter reading system now or later. The modular system half body is connected with a Pipe Cone onto a 500mm powder coated aluminum pole and secured with four bolts. 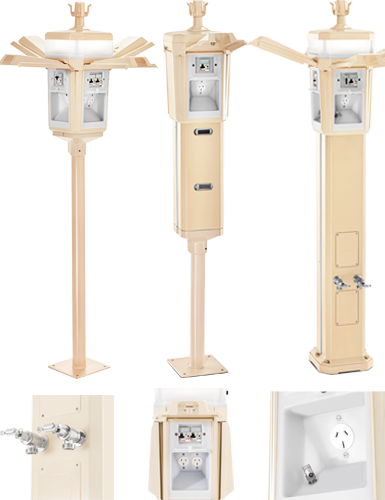 The C2-1000 pedestal version is usually chosen when customers want to provide water in addition to 15amp outlets and other services. Pedestals are bolted to a base plate 240mm x 240mm square which must first be bolted to a prepared concrete slab (approximately 500mmx500mm) using four 3/8” dynabolts. For accurate installation Comsen recommends the custom made rag bolt if new concrete is being laid. All Comsen units are approved by the S.E.C. (Certificate of Suitability) No`s 414, 513 & 514 and by Austell (permit No: A90/831/0226). Models are also available as approved by Underwriters Laboratory (UL) in America and Canadian Standards association (CSA) in Canada. Additional Power Outlets up to 8. Additional Safety Switches up to 8- circuit breakers (RCD/MCB). Add a Light – 6000K LED with Diffuser. Add a PE cell to control light. Add up to 4approved panel mount or din-rail Meters for user pay power. Add Locks to the latch doors to prevent unauthorised access. Custom height pole up to 1000mm. Remote metering controllers to link with Comsen Control Remote Utility Management system. Impact and UV resistant non corrosive PVC body with a 20 year guarantee. Proven in the field under the harshest weather conditions. Design provides resistance to vandalism. Proven watertight with RCBO`s fitted inside the weatherproof, IP66 rated enclosures. Easy access for electricians to all 15amp power outlets and electronics. Sturdy powder coated cast alloy pipe cone base for easy connection to existing posts. Modular system design allows for many customised service combinations to suit needs. Quality electrical components and safety switches providing reliability with a 5 year warranty. Paperbark colour to blend with the outdoor environment. All parts moulded and certified to ISO quality manufacturing standards in Australia. Design and electronics fully compliant to the Australian/ New Zealand Standard – Electrical Installations (Caravan Parks) AS/NZS 3001:2008. Pole version – 1600mm on full pole. UV stabilised and resistant polycarbonate 15 amp IP66 Power Outlet. 16 amp Electronic Safety Switch – RCD/MCB. Four access panels for servicing. Electric cabling enters the unit through the base. Marine grade stainless steel nuts, bolts and screws. Optional LED light radiance is 6000K. Light filtered downwards through UV stabilised Diffuser providing safety illuminance.